When exposed to the protein CLCA1 (red), human cells start to express the chloride ion channel TMEM16A (green) on their surface. 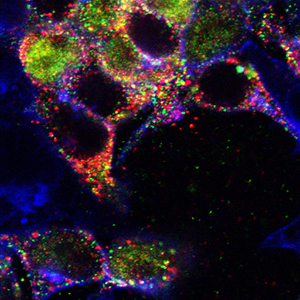 New research at Washington University suggests this protein and channel may work together in the over-production of mucus characteristic of diseases such as asthma and chronic obstructive pulmonary disease (COPD). In diseases such as asthma and chronic obstructive pulmonary disease (COPD), the body produces too much mucus, making breathing difficult. New research from Washington University School of Medicine in St. Louis provides clues to potentially counteract inappropriate mucus production. The study appears March 17 in the journal eLife. About two decades ago, the protein CLCA1 was identified. High levels of CLCA1 in cells lining the airway have long been linked with an overproduction of mucus. Studies at the time suggested CLCA1 was an ion channel, a small opening in the cell membrane that allows charged particles to flow into or out of the cell. CLCA1 was labeled a chloride channel because it appeared to be moving chloride ions across the cell membrane. In general, the movement of different ions into and out of cells govern many important processes from mucus production, to heart rhythms to brain function. Only seven years ago, a protein that proved to be this elusive type of channel was first discovered in mammals. Called TMEM16A, it is a channel that is ubiquitous in the cells lining the airway. Too much TMEM16A, like elevated levels of CLCA1, were also associated with the mucus-overproduction typical of airway diseases, including asthma and COPD. The new research now has linked the two, demonstrating that increased expression of CLCA1 increases the number of TMEM16A channels present in nearby cells, according to Brett and his colleagues, including co-authors Colin G. Nichols, PhD, the Carl F. Cori Professor of Cell Biology and Physiology, Monica Sala-Rabanal, PhD, research instructor in medicine, and Zeynep Yurtsever, graduate research assistant. The study also suggests it may be worthwhile to investigate the larger families of these two proteins. If closely related members of these protein families also interact with each other, it could expand the implications to disorders as diverse as cancer and cardiovascular disease. For example, TMEM16 channels and CLCA proteins have been associated with certain types of cancers including breast tumors that spread to the lungs and in some cardiovascular disorders such as irregular heart rhythms and heart failure, demonstrating a possible broad impact of future work in this area. Brett said the team is continuing to study these interactions to learn more about how increasing or decreasing expression of the protein or the channel may influence the currents, and what impact that may have in airway diseases. This work was supported by the National Institutes of Health (NIH), grant numbers R01 HL119813 and R01 HL54171; the American Lung Association, grant number RG 196051; a CIMED (Center for the Investigation of Membrane Excitability Diseases) Pilot and Feasibility grant; and the American Heart Association Predoctoral Fellowship, grant number PRE19970008. Sala-Rabanal M, Yurtsever Z, Nichols CG, Brett TJ. Secreted CLCA1 modulates TMEM16A to activate Ca2+dependent chloride currents in human cells. eLife. March 17, 2015.